An ambidextrous company is one that balances the natural tension between what innovation researchers have labeled its exploitation (running a business efficiently) and exploration (finding new businesses) behaviors. This tension results in a ‘dance’ between business units and those in the company who are charged with long-term exploration. The dance can either be ad-hoc and clumsy, or choreographed and powerful. Large companies need a corporate innovation group (CIG) to balance their exploitation and exploration activities. The CIG needs to build a comprehensive innovation system that supports the successful creation of both sustaining and strategic innovations. The different types of opportunities that emerge along the sustaining – strategic continuum determines the type of interactions, or dance, between the CIG and the operating businesses. Company leadership needs to understand what is possible with strategic innovation and what to fear without it. They need to creatively manage the tension between the exploitation of the business units and the exploration of the corporate innovation group through the ‘dance’ that they direct. Thirty years ago, James March  wrote about the tension between the Exploration vs. Exploitation imperatives of large companies.. In 2017, Innovation Leader published the results of a survey on Innovation Teams and Business Units: Allies or Adversaries . Clearly the problem has not been resolved. Deming taught us that variation is the enemy of quality, and we have spent the past 40 years stamping out variation in production, in development, and in all other matters of corporate behavior. Variation is the enemy of operational excellence. Reducing variation is how companies make profits, and how executives get promoted. But with innovation, businesses must change, which in turn requires variation. Variation (and selection) are the drivers of evolution. Without them, species don’t evolve, and they can go extinct. In a business world without variation, innovation can’t happen, and companies can become irrelevant – and also go extinct. In 2011, O’Reilly and Tushman  built on the Exploration-Exploitation concept to create what they called the Ambidextrous Organization. Such an organization can achieve both operational excellence and transformational growth simultaneously. Unfortunately, this is easier said than done. The tension between operational excellence and transformational growth has been exposed and examined. But the problem is becoming ever more complex and companies still struggle. It’s a struggle that is manifested in the ‘dance of the corporate innovators.’ The dance is happening within and between the groups and teams at the company that are ‘doing’ innovation, but nowhere is the dance more evident than in the interaction between a company’s business units and its corporate innovation group (CIG). Like any dance, it can be ad-hoc and awkward, or it can be choreographed and powerful. More importantly, when the dance is choreographed well, it can channel the natural and unavoidable tension in creative and surprising ways. A new type of dance is needed for corporate innovators. Operating businesses are now better at sustaining innovation. New tools and processes (such as Open Innovation, Voice-of-the-Customer, Stage-Gate 2.0, etc.) enable operating businesses to innovate successfully in or near to their core. It’s no longer an issue of ‘can a business innovate’, but what types of innovation can a business achieve on its own? And are they sufficient to achieve strategic objectives (or, worse, to avoid disruption)? Unfortunately, the answer is usually “no”. To get a better picture of this, a tool such as the Strategic Innovation Canvas, shown below is useful. It lets companies see where they are spending their innovation resources and being successful at it. Strategic opportunities are a very different thing than sustaining opportunities. They should not be undertaken with the same processes, methods, and tools used to undertake sustaining innovations. Stage-gate doesn’t work well. You need another mechanism. Companies that are successful at strategic innovation typically embed this different mechanism in a Corporate Innovation Group (CIG). The problem to solve is not organizational – whether the CIG should be ‘Intertwined’ with or ‘Insulated’ from the business units – but rather operational. And the source of tension occurs at the opportunity level. There are four types of opportunities that the CIG deals with and needs to manage, both at a strategic level (what is the proper mix) and at an operational level. Type 1 – BU Routine: Opportunities a BU would surely pursue if they only they had more money. These are the opportunities a BU will clamor for the CIG to help with. Type 2 – BU Stretch: Opportunities that the BU see as interesting…eventually. Today they are too far out or too risky. The BU can support the CIG pursuing these opportunities and will take them over once they are further along. Type 3 – BU Transform: Opportunities that the BU can’t see as relevant to their business until there is ‘proof of value’ (e.g. it’s a nascent business creating real traction and revenue). Type 4 – BU Antagonistic: Opportunities that are of no interest to a BU, and never will be – no matter how successful they become. Even though they lie within the strategic vision of the company, the BU sees these opportunities as either a distraction or a threat and resists them. A corporate innovation group should never take on Type 1 opportunities. It’s a waste of strategic resources. Type 2, 3 and 4 opportunities should be the focus of the CIG. Type 2 should be undertaken with BU participation and with their ‘head in the game’. Type 3 and 4 opportunities should be undertaken with no requirement of up-front BU commitment, but with a path that permits BU participation as the opportunity comes into focus. Type 4 opportunities are the ones a BU will never take on and will become their own BU, or take some other value creation path (e.g., spin-off, divesture, etc.). The tension between a company’s short-term growth, driven by operational excellence and sustaining innovation, and long-term growth, driven by strategic innovation and transformational opportunities, becomes ever more pronounced in today’s world of rapid change and uncertainty. The ability to sense potential disruption and transformation, and do something about it, becomes a critical competency (indeed, this is one source of Type 3 and 4 opportunities). But spending time, attention and capital on this creates the tension that reveals itself in the Corporate-BU relationship every day. It is a tension that can be destructive. But like a good dance, it can also be powerfully constructive and invigorating. Recognizing the sources and dimensions of this tension is the first step in creating the right type of dance for your company. A New Wave of Long-term Thinking? The signals are getting stronger that a new wave in corporate management is coming in which long-term vision will supplant quarterly profits as the primary imperative. Just read what Larry Fink of Blackrock wrote in his 2017 annual letter to CEOs. A recent article in HBR provides evidence that this wave of long-term thinking is gaining traction and having an effect. Other evidence and signals abound such as the behavior of founder-owner-CEOs and their ability to ignore Wall Street’s clamor (e.g. Amazon), the behaviors and performance of private companies (e.g. Cargill) and the delay of many startups going public. Companies need to be prepared for this new world of long-term thinking, but most are not. The decades they have spent optimizing themselves for operational excellence to deliver a steady stream of quarterly and year-over-year profit increases has not let their long-term muscles develop. Except for a small percentage of companies, most of corporate America is ill-equipped to execute for the long-term. As an alternative, they turn to M&A strategies. How do we know this? Look at the averages for how many disruptive, transformational or horizon 3 opportunities a company has in its portfolio, and how many have been launched. Look at the average lifespan of the corporate innovation group and what happens to them during a business cycle downturn. Look at the innovation management systems (or lack thereof) they use and if it’s just a variant of their new product development stage-gate process. Look at the new innovation approaches and tools introduced over the past two decades – open innovation, voice-of-the-customer, design thinking, test and learn and the latest one, startup collaboration – and ask yourself, have any of these really moved the needle? What all of this has done is to make companies really good at sustaining innovation that is close to their core. After years of perfecting new product development systems that are finely tuned for sustaining and near-adjacent opportunities (typically based on the stage-gate principles and design), companies haven’t addressed the root cause of why they are so poor at creating strategic innovations. For that, you cannot just keep piling on new processes, methods and tools, you need a new system that is purposely designed to create strategic opportunities. Research indicates that strategic innovations are a major source of long-term growth and profits  yet the majority of CEOs do not feel that their companies are good at strategic innovation . It is likely that the innovation management system you have now isn’t up to the task of predictably and regularly creating the strategic innovations that will drive the long term, accelerated growth that investors like Blackrock are looking for. Long-term thinking, and long-term innovation requires a new system that creates a new type of ‘dance of the corporate innovators. Like a modern, professional dance, it requires a producer, a director, a choreographer, lead and supporting dancers, and a host of supporting roles and functions. And it also requires an audience that will eagerly pay for the performance. Creating an ambidextrous organization, one that is good at both exploration and exploitation, requires very different skills, mindset and approach. It is very rare to have an ambidextrous executive embody both of these mindsets and apply them, at will, in the appropriate situation. People are just not normally built this way. In many ambidextrous companies, what one finds is that there is a close ‘partner’ involved, another C-level executive, that is the other side of the CEO’s brain. The classic case of this is Hewlett and Packard in their heyday. The success or failure in creating an ambidextrous organization often comes down to whether the CEO, who often comes up through the operational excellence or exploitation side of the company recognizes and acts on the need to create a long-term thinking culture and the need to be ambidextrous. If they do recognize the need, is this understanding actionable? Finding the right person to be the other half of their brain is nice, if they can do it, but it is not a reliable and repeatable process that can be taught. More often the situation is that the CEO ‘gets it’ in a general, visceral sense, but is struggling with how to take action. His CTO and CIO are pushing one way, his CFO and CMO another. The heads of the BU’s are constantly saying that they need more money and resources to grow their businesses. The ‘frozen middle’ is resistant to the types of changes that are required. The culture of the company needs to change. To push back against BU’s constant demands, to properly fund and staff a corporate strategic innovation function, to be willing to embrace uncertainty and push the company’s strategic boundaries, C-level executives need more than just a visceral sense that strategic innovation is important. They need a well-designed strategic innovation system. One common response of CEO’s is to put someone in charge of ‘Corporate Innovation’ and give them the task to ‘figure it out’. When this person comes back and says that, to do this right, a $15M yearly budget and 15 people in the corporate innovation group are needed, the response is often ‘that’s way too much, can’t you do it for less?’ or ‘let’s start small, prove it works with some quick hits and then we can ramp up’. Enlightened C-Level executives recognize the need for transformational growth but are often unsure about how to achieve it. And they are often surprised about what it really takes. C-level executives need to understand and to feel what is possible with strategic innovation and what to fear without it. They need to figure out how to creatively manage the tension between the exploitation and the exploration activities of the company for the benefit of both. To do this requires a system and central to that system is the Corporate Innovation Group (CIG). While the CEO (and other C-Level executives) are the producers of the dance, they need a world class choreographer and director to make sure they get the dance right. That’s where the CIG comes in. “Marketing gets a great new idea, R&D creates it, then no one buys it”. Creating a successful CIG is hard. As one executive stated, “About 80 to 90 percent of innovation centers fail, and end up being a massive waste of resources.”. Get the design, implementation and deployment of the company’s innovation system right. Balance the exploitation and exploration behaviors of the company to make strategic innovation outside the core possible. Manage the creative tension with the BU’s to the company’s benefit. Navigate the continuous balancing act that is required to insure a combination of independence from, and connection to the company’s businesses and people. 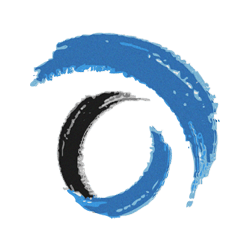 Translate company strategy into actionable charters for strategic exploration. 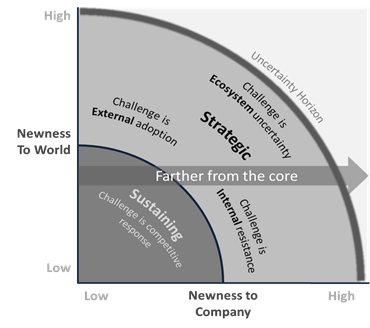 Interpret existing business strategy, in whatever form it exists, to insure strategic innovation efforts are focused on strategically relevant domains that align with the core mission of the company. These domains may or may not align with existing businesses. Discover new, strategic opportunities that would not otherwise have been found with methods used for sustaining innovations. Develop new discovery methods that go beyond the typical idea sources and channels. Move fast in the face of uncertainty. Develop processes and decision mechanisms that are not dependent on existing, slow moving, corporate business practices. Be an example of the culture and practice of innovation and be proactive in sharing and helping others to adopt this culture and practice. Explore plausible futures and do experiments to learn more about the future. Be explicit in examining how the future can plausibly unfold, not next year or in 5 years, but in 10 – 15 years. Use these insights to expand your, and the company’s, strategic perspective. Incubate new businesses then transfer them to the BUs. If that’s not possible, launch them to create a new BU or undertake some other value creation path (spin-off, license, etc.). Support the BUs in their strategic efforts but don’t be constrained by the BU’s strategic boundaries. Create sensing mechanisms to detect potential disruption and opportunity. A sensitive radar is not just a matter of setting up content alerts and reading the latest literature and news. It involves active experimentation with very-early stage partners, purposeful futuring to expand the envelope of what can be imagined and extensive networking outside the community the company normally interacts with. All of this takes place within the context of a company with its own cultures and behaviors that are likely ingrained over decades of existence. Each company will have its own dance. The dances will be similar (e.g. they will all be tangos) but they will vary in particulars of rhythm, pace, connection, movement etc. Getting the dance right requires a number of factors to come together – the innovation strategy, the organizational structure, the operation and governance, the people, the metrics, etc. The dancers themselves, the innovators in the CIG and in the BUs, must connect in the right ways despite their independence. Funding of the CIG must be separated from the BU’s yet aligned with their priorities, the governance body must include stakeholders from across the businesses. There needs to be channels to infuse not just new ideas and creations back into the businesses but new methods, tools and even culture. All these factors, and more, inform the nature of the particular dance a company must choreograph for itself. The dance of the corporate innovators takes place every day and continues over weeks, months, years and decades. The dance itself is continually being revised, reinvented and retaught as participants enter and leave, as new innovation methods and tools are adopted and as the company itself evolves in its organization, culture and operations. At its core, the dance is all about how to be successful identifying, creating and realizing strategic innovations that transform the company so that it can create the future it envisions and reap the value that comes from this. The strategic innovation canvas is one tool that reveals the differences in the types of opportunities a company must create and be prepared to deal with. This classification is different from the typical core, adjacent, transformational or horizon 1, 2, or 3 etc. It takes into account the BU’s culture, mindset and behavior. There may be adjacent, horizon 2 opportunities that BU’s will support up front or along their journey to realization and ones they won’t. The same even goes for some transformational, horizon 3 opportunities. It’s also not a question of whether the opportunity is worth pursuing. Opportunities that are represented on the canvas have already been vetted and time and resources are being spent on them. The big question is how the CIG should act with respect to the different types of good opportunities at various levels of uncertainty. These all fit the company’s vision and strategy and have large value potential. The chart below shows the different paths the different types of opportunities take as they go from concept to reality. 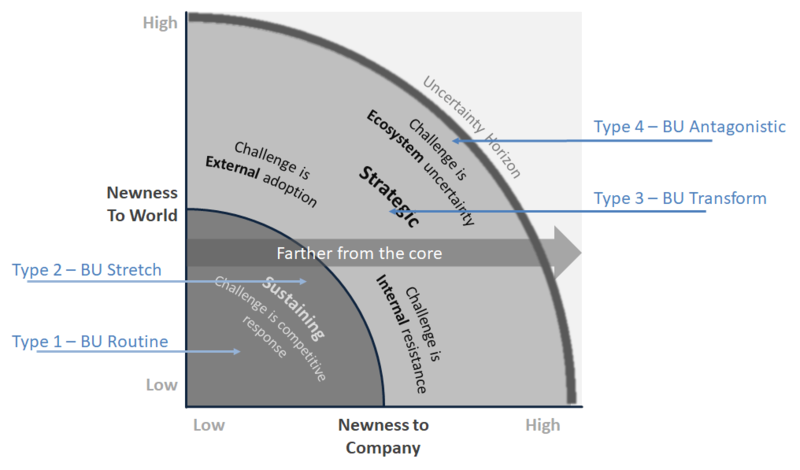 A particular opportunity will occupy a location in this matrix depending on the type of opportunity it is (as determined by the Strategic Innovation Canvas) and its readiness level . Opportunities that are farther outside a BU’s strategic comfort zone take longer, and require more proof of value, before they can be transitioned. Some may never get there and the company needs to have a mechanism for value creation that is outside of an existing business. The difference between business unit realities of near-term profits generating baseline growth and corporate strategic desires for long-term transformation and accelerated growth creates a fundamental tension within all companies. This tension must be managed. If it is managed poorly, the tension can be destructive. If it is managed well, the tension can be constructive and create real value. The metaphor of a dance reveals the ebb and flow, the tension and release, the constant motion and choreography that is required to do this well. It takes a community to create a good dance. Every corporation is different in their particulars, but they are alike in their need to be ambidextrous – to balance their exploitation and exploration behaviors – and the way to do this is to have a corporate innovation group that makes sure the dance is done well. Sorescu, A. B., Chandy, R.K, and Prabhu, J. C. (2003), “Sources and Financial Consequences of Radical Innovation: Insights from Pharmaceuticals” J of Mktg 67 (Oct): 82-102. People talk about ‘skin-in-the-game’. While money is nice, it is attention and interest that is really valuable.